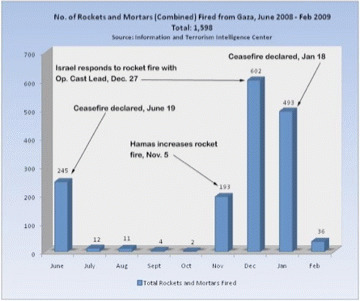 Since Israel’s unilateral ceasefire on Jan. 18 following the operation, Hamas and other terrorist groups in Gaza have fired rockets and mortars at Israel at the rate of 2.2 a day. The Israel Project (TIP) an international non-profit organization, provides journalists and leaders accurate information about the Middle East. TIP is not related to any government or government agency.